PERRY HALL, Md. 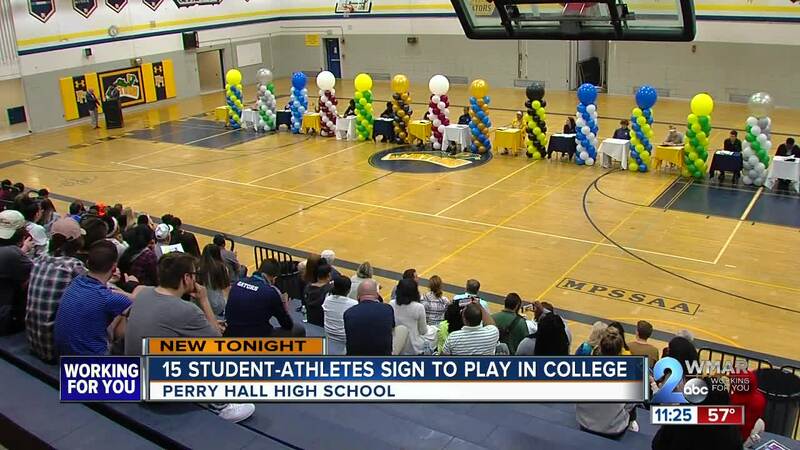 — Student athletes from Perry Hall High School, 15 in all, celebrated their next steps on Tuesday night. The athletes participated in signing day, showing their commitment to become collegiate athletes by officially signing their National Letters of Intent. Some of the students are going to junior college, others are going to Division I, II or III schools. "I'm finally ready to take my talents to Fairmont State University. I've been playing football all my life. I'm just ready to continue my journey," said DJ Cloude. He received an athletic and academic scholarship for a full ride to Fairmont. Cloude said he's going in as a back-up wide receiver but is planning on working his way to a starting spot. His other classmates celebrating Tuesday night were just as eager to get started and prepare for pre-season. "Last year there was like five people. This year it's crazy how people have committed, who are actually taking it serious and going places," said Ashlee Wilswinski, who's going to St. Leo's University in Florida for lacrosse. She was standing with her friend Phoebe Canoles, who's going to Towson University for soccer. "It's just really good to see because, coming from the Perry Hall community, just a lot of people focused on their community, it's cool to see," said Canoles.